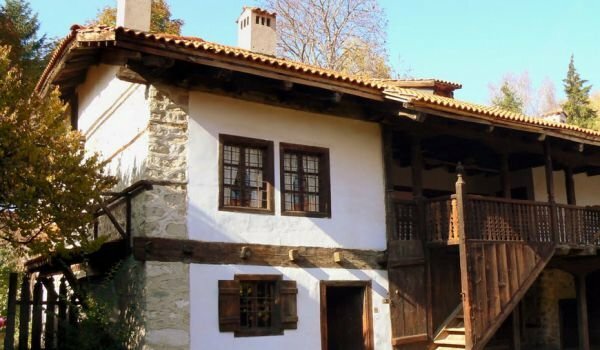 Neofit Rilski House Museum is located in close proximity to Sveta Troitsa Church in the center of Bansko. It's open to visitors every day from 9 am - 12 pm and 2 pm - 5 pm. There are recordings in English, German and French for tourists. Neofit Rilski House Museum was opened to the public in May 1981 to mark the centennial of Neofit Rilski's death. The house has been managed by relatives of Neofit Rilski until it became a permanent museum exhibit. Neofit Rilski (or Neophyte of Rila) was born in this house in 1793 to a family of merchants and diplomats, a notable Bansko family. He was from the Benini family, who traded with West Europe, on his father's side and from the Germanovi family, who gave several diplomats to the political life of the Principality of Serbia, on his mother's side. Neofit Rilski House Museum has been kept authentic since the time of Neofit Rilski, while only undergoing cosmetic changes. Characteristic of Bansko houses is that they are double pane and have 2 stories. The entrances have a low ceiling, which is symbolic, so that whenever someone steps through the threshold they bow their heads to the master of the house. This was common during the time of Ottoman rule, so that the insubordinate Turkish man would inevitably bow to the Balkan man. As such, he would express his respect to the master of the house. The first floor contained the auxiliary rooms, while the family lived on the upper floor. The house is unique in that it is a sort of miniaturized fortress, girded on its exterior with another row of walls for hiding and escaping; there are 4 exits leading to it throughout the house. The tunnels and secret passages have been preserved in the museum. They allowed the family to hide if need be. Each room, including the 2nd floor rooms, had an exit to the outside via the secret passages. The first floor contained the kitchen, distinguished by its double oven, something not typically seen in other old houses in Bansko. Here lay the storage room, bread-kneading room, a smaller room with an oven where the family could hide in times of trouble, as well as the small opening to the secret escape tunnel that goes all around the house. Immediately adjacent to the kitchen is the animal outbuilding, which impresses with the frescoes painted by artist Todor Tsonev, who portrayed Neofit Rilski's family tree on the walls. In the middle is Nikola (his secular name) himself, his mother Katerina on the left and his father Peter, a priest, on the right, who was a religious school teacher. Neofit Rilski had 2 sisters and 1 brother. 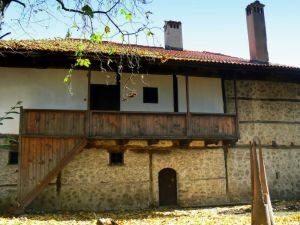 The 2nd floor contained the religious school, the women's room - intended for childbirth, a kitchen and bedroom - a large room called "kashchi" in the Bansko dialect, Peter's confession box. The verandah led to the animal outbuilding, which has now been turned into an exposition. Contained therein is one of the pieces of evidence proving that Neofit Rilski was indeed from Bansko, in answer to the numerous arguments and debate over where he was born. Another curious detail from the life of Neofit Rilski is that he helped build the "Iron Church" in Istanbul. Patriotic Bulgarians, with Neofit Rilski among them, decided to construct an impressive new church in place of an old shabby Bulgarian church. At the time there was a law stating that if the foundations of a new church were laid out over the old church in a single night it would then be legalized. And so, the Bulgarians took up the challenge of building the new church, bringing in metal constructions from Vienna ahead of time and burning down the old church. By morning, they had laid out the foundations of the Iron Church in Istanbul - Bulgarian St. Stephen Church. His seal from his days as hegumen at the Rila Monastery is also kept there.